Sometimes it’s hard for us to realize there is a life outside of our Capitol Hill basement, especially when we do venture out and everything sounds the same. 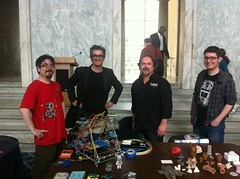 Last week I headed out with Open3DP to Washington DC, for a whirlwind trip of 3D printing in our Nation’s Capital. I showed off the Clonedel and some of our new powder-printing skills to the House of Representatives and met up with Makerbot, Shapeways, Reprap and a whole host of 3D printing and DIY fabrication folks who were invited by Public Knowledge to talk about Intellectual Property and this new age of being able to make awesome things without having to go through the traditional manufacturing process. It was a fun-filled trip that involved a lot of robot-building, plastic space-invaders, bar-hopping and a couple of nervous TSA agents. 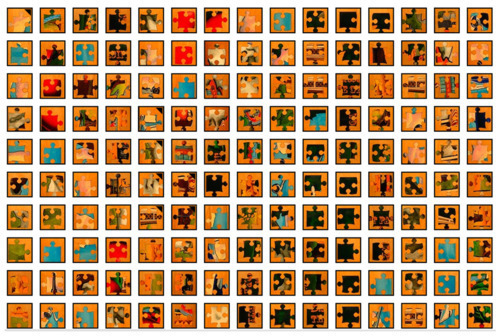 The second part of this exciting post is that we got to give local artists Sutton Beres Culler a hand with a really cool art piece (or rather 150 pieces) for Creative Capital’s 2011 Benefit Auction on the 5th of May. All of us at the shop have been wondering how this piece would come out once they got their hands on it, and it looks just amazing. I can’t wait until we see the pictures from the final interactive assembly at the benefit. If you are in New York (or heading to New York), tickets are still available for sale online.